MOST RECENT POST FIRST. PLEASE SCROLL DOWN THE PAGE FOR OLDER ONES. August 17 2012 post. Mainly for reasons of space, I decided to post only one of TAB’s graphs. 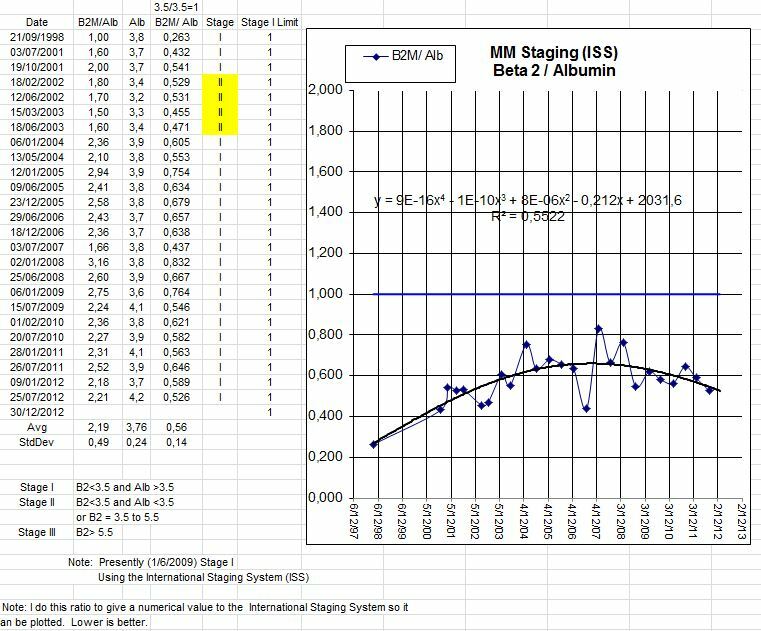 I chose this particular one because it shows his data in reference to the International Staging System, or ISS (seehttp://goo.gl/ycu7K for more info on this myeloma staging system, courtesy of the IMF). As you can see, TAB’s ISS trend is a downward one, which is excellent, of course! And now let’s finally have a quick look at what I’ve been calling Plan B. In a nutshell, back when I was having all that technical trouble (all resolved now, btw…in fact, I have just been awarded the coveted title of “Summer 2012 Fastest Converter Wizardess” ), TAB informed me that he set up a public e-mail address that you can use to get in touch with him directly. Purrrrrfect. So, if you have any questions for TAB or would like to see more of his graphs etc. etc. etc., all you have to do is write to him here: tabbat841@hotmail.com. Okay, I think that’s about it!!! Except, of course, that I’d like to thank TAB for his kindness and his patience! August 15 2012 post. Here is TAB’s summer 2012 update. Before reading it, though, please take note of a KEY sentence: These supplements may or may not work for others as they apparently do for me.That is soooo true. It’s the same with curcumin, which may not work for some folks yet works splendidly for others (like yours truly ). I have now been smoldering for 15 years. IgA is the lowest ever in 15 years. Still feeling fine with no symptoms. I am continuing with my supplements. If anyone wants a copy of my data and graphs, they are available at tabbat841@hotmail.com. I am doing just fine so far. Smoldering for 16 1/2 years. No treatment thus far, just supplements. I recently discovered this website and have really enjoyed it. I have been smoldering for almost 4 years. (discovered accidentally thru weakened immune system issues.) I am really interested in hearing of what supplements totally you are taking and what diet you have adapted. I have definitely cleaned up diet the last 2 months of discovering all this and now ready to start some kind of supplments to hopefully help. I also am IGA, 4,14. Numbers have been steadily creeping closer to SCT. No treatment yet. I am kinda a computer illiterate but still learning. When I tried to email you on your Hotmail account it would not work. Hopefully, this gets thru. congrats Tab on your continued success! Can you tell me if you have any abnormal chromosomes? I also would like to know your protocol. I have now been smoldering for 17 years. No CRAB symptoms and I remain asymptomatic. I remain on my supplements. My IgA and M spike have been on a fairly linear decrease for the past 10 years. I firmly believe that the supplements have contributed to the observed regression. In my opinion I have moved from myeloma to MGUS. I continue to graph all of my markers. My latest graphs and list of supplements are available to anyone who would like a copy by E-mailing me at tabbat841@hotmail.com. I have psoriatic arthritis which carries a lot of inflamation also hve colon and digestive problems and lots of other inflamatory things. I was wanting to start taking curcumin but do not know what one is best and works well for inflamation. I have gotten confused on all the different ones listed. I am 73 years old and needto take a good one that is not real expensive. Would you send me a list of what you take vitamins included. I know we dont have the same disease but still i would appreciate your information. Since I don’t have your e-mail address just drop me a note at tabbat841@hotmail.com and I will send you the information. Any new post by TAB ? How is he doing? Me, MM for 8 years smoldering for 10 years. Alternatively only!! I have now been smoldering for almost 18 years. No CRAB symptoms and I remain asymptomatic. I remain on my supplements. My IgA and M spike have been on a fairly linear decrease for the past 10 years. I firmly believe that the supplements have contributed to the observed regression. In my opinion I have moved from myeloma to MGUS. During my last 6 month checkup my doctor said I am the longest smoldering myeloma patient he has ever seen. I continue to graph all of my markers. My latest graphs and list of supplements are available to anyone who would like a copy by E-mailing me at tabbat841@hotmail.com. Thanks to the many fellow MM’ers who have requested copies of my data. I wish you well. Also thanks to Margaret for sharing my story with her blog readers. Thank you so much for your post. I am also SMM. Have been for 6+ years and hope for many more. Get my blood work q3 months and recently sought a Second opinion at a Multiple Myeloma at a large facility in LA. I’m curious, what supplements have you been on? I also, have hx of Breast CA 2004. Status post lumpectomy with Chemo and Radiation. Being a nurse in healthcare, I do pursue care however, it’s also certain that I would like to NEVER have Cancer again. So pleased to hear that you are doing well TAB!!! I am doing well, feeling fine and playing a lot of golf at age 75. Still smoldering for 18 years. No CRAB symptoms. My latest 6 month tests show my IgA and M spike are still on a linear decline as they have been for the last 11 years. Also serum free lambda light chains are on a linear decline for the past 6 years. I am still on my supplements and have added Ashwagandha which seems to be helping the trends. As in the past my reports are available at tabbat841@hotmail.com . If you have requested copies of my results last time things are about the same this time. Thanks Margaret for your support. It was so shaking to hear this as you can imagine. After my searchs I found out your cure way.Is it possible to help me and give me some advises? I would be so thankful. Thanks Margaret for your support. I have been smoldering now for 19 years. I am feeling fine with no symptoms. I owe this (in my opinion) to my supplement routine which includes curcumin. My latest IgA immunoglobulin level is the lowest it has been in 19 years. As usual my graphs and supplement protocol are available at tabbat841@hotmail.com. Thanks to Margaret for mentioning me in her latest blog post. PS: I recently learned something very important from a fellow MM’er. It is very important to monitor your light chains. This person has been monitoring her light chains for years. A sudden significant increase in the light chain trend line triggered an important treatment decision that may have been missed or delayed. At age 77, I have been smoldering for 20 years. My doctor said I am the longest smoldering patient he has ever seen. I am feeling fine, no symptoms and no pain anywhere. 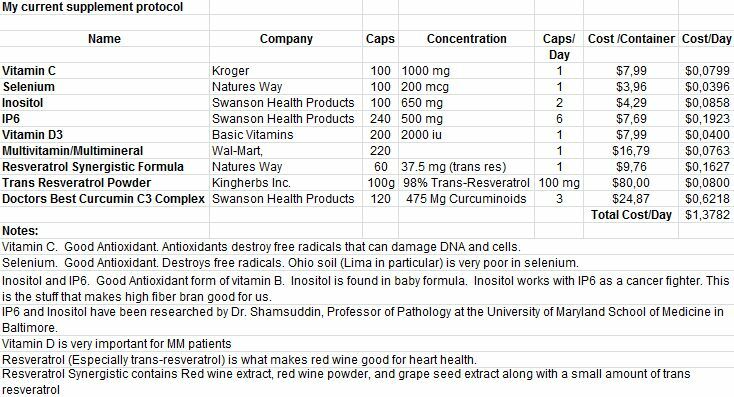 I am still a believer in supplements that are listed in my report. I have never been on any MM treatments or taken any prescription drugs. As always I have been tracking my MM with graphs of my blood work. If you are interested in viewing my latest report in Excel and PDF format I can E-mail you a copy. You can contact me at tabbat841@hotmail.com.